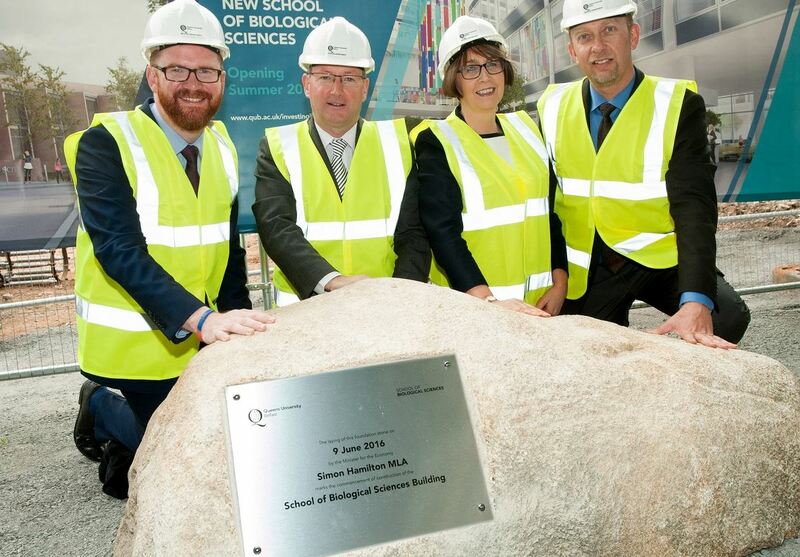 Queen’s has unveiled the foundation stone of its new £39m School of Biological Sciences building in Chlorine Gardens. The new premises will offer state-of-the art teaching and research facilities for 750 students and 170 staff, who will tackle some of the world’s most pressing agri-food related issues. The School of Biological Sciences will be a key driver for the development and future growth of the life sciences and agri-food sectors in Northern Ireland, which currently employ some 80,000 people and generate more than £5.5 billion in sales each year. Construction of the new facilities will also support 550 jobs in the building sector, including staff from the main contractor O’Hare and McGovern, and a range of other firms. Due to open in 2018, the building will provide facilities to help grow the life sciences sector, in areas such as agriculture/food science, food safety, disease/infection biology, diagnostics, waste management, ecosystems and the environment. The new 11,000m⊃; School is the latest building in Queen’s £700m 20-year capital investment programme to support world-class research and education and provide an exceptional experience for its students. Speaking ahead of the unveiling, Queen’s President and Vice-Chancellor, Professor Patrick Johnston, said: “Today is a momentous occasion for the life sciences and agri-food sectors here in Northern Ireland, and further afield. Queen’s new School of Biological Sciences will be a power-house for these sectors, both of which have been identified as cornerstones of Northern Ireland’s future prosperity. Head of the School of Biological Sciences at Queen’s, Professor Aaron Maule, added: “To ensure Northern Ireland’s crucial agri-food and life sciences sectors can remain competitive at home and internationally, they need access to a highly skilled workforce who have been educated in a way that is directly relevant to their needs. O’Hare & McGovern Managing Director Eamon O’Hare said the new building would be a world-class facility which strengthened the firm’s long term relationship with the University as they continued to enhance Belfast’s educational landscape. Media inquiries to Anne-Marie Clarke (Mon-Wed) or Michelle Cassidy (Thurs-Fri) at Queen’s Communications Office, T: +44 (0)28 9097 5310.